“Writ of Habeas Corpus, Order of Discharge, No. 10036,” 1891, Chinese Exclusion Act case files, RG 85, National Archives at Seattle, Yee Ah Jin case file, Seattle Box 706, file #7030/9143. 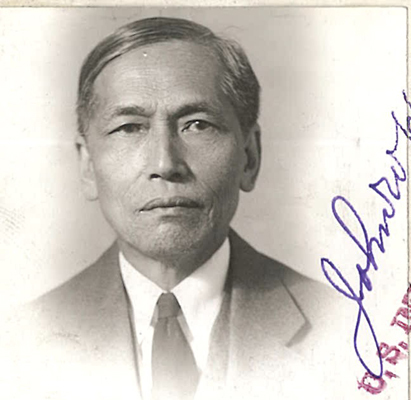 According to the 1891 findings of S. C. Houghton, Special Referee and Examiner of the District Court, Yee Ah Jin was born in the United States and was a citizen entitled to re-enter and remain in the U.S.
Yee Ah Jin 余亞振 was born in San Francisco in 1869, the son of Yee Look Long and Lee Shee. He left San Francisco on 6 January 1882, before the Chinese Exclusion Act was passed on 6 May 1882 and returned on 25 September 1890. Yee Ah Jin applied to land at the port of San Francisco and his application was denied. His uncle Yee Gum Jung signed the petition for his Writ of Habeas Corpus and it was filed by Southard Hoffman, Clerk. Hon. Judge Ogden Hoffman of the District Court of the United States, Northern District of California District, declared that Yee Ah Jin had been illegally restrained of his liberty by Captain Pearne, Master of the S.S. Gaelic. 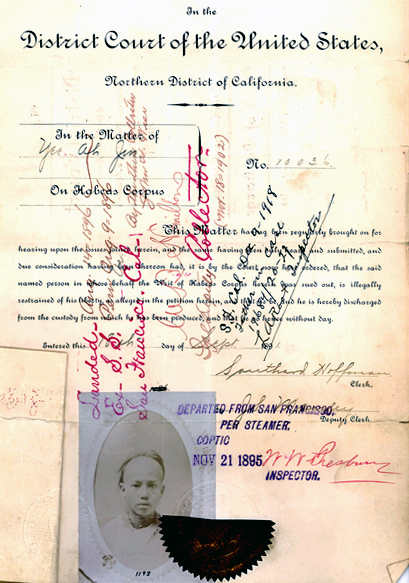 Yee was discharged from custody of 18 September 1891 and admitted to the United States. “Yee Ah Jin, Form 430 photo,” 1936, Chinese Exclusion Act case files, RG 85, National Archives at Seattle, Yee Ah Jin case file, Seattle Box 706, file #7030/9143. Yee made several trips between China and the United States landing in San Francisco in 1910, 1918, 1922, and 1930. The final trip recorded in his file was on 15 December 1937 arriving at the Port of Seattle. He was 68 years old, living in Detroit, Michigan; married to Soo Hoo Shee. His marriage name was Shew June. They had six children–five sons and one daughter. Three sons were living in the United States.